YOUB, L. , BELKACEM, S. , NACERI, F. , CERNAT, M. , PESQUER, L. G.
In this paper, a new control strategy is developed; an adaptive fuzzy controller based on Lyapunov's stability theory (AFLC) recalculates the real-time PI-fuzzy gains and combines the advantages of two robust techniques i.e. the fuzzy logic control and the adaptive one. For the new adaptive fuzzy control, we followed two steps: in the first one, a PI-fuzzy controller is designed, in the second step, the gains of a fuzzy regulator are determined. Extensive simulation results are presented to validate the proposed technique. The system is tested at different speeds and a very satisfactory performance has been achieved. S. Lekhchine, T. Bahi, Y. Soufi, "Indirect rotor field oriented control based on fuzzy logic controlled double star induction machine," International Journal of Electrical Power and Energy Systems, Elsevier, vol. 57, pp. 206-211, 2014 . 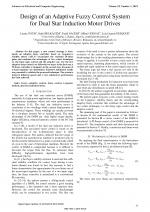 H. Khouidmi, H. Benbouali, "Reduced-Order Sliding Mode Observer-based Speed Sensorless Vector Control of Double Stator Induction Motor," Acta Polytechnica Hungarica, Vol. 11, No. 6, 2014. H. B. Hamed, M.D. Mehdi, S. Lassaad, "Direct rotor field-oriented control of a dual star induction machine," 2017 International Conference on Green Energy Conversion Systems (GECS). I. Kortas, A. Sakly, M. F. Mimouni, "Optimal vector control to a double-star induction motor," Energy, vol. 131, Issue C, pp. 279-288, 2017. 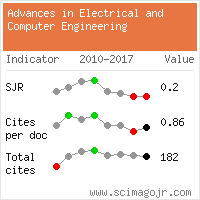 Citations for references updated on 2019-04-22 04:38 in 189 seconds.